At the Curious Ostrich we provide updates and analysis on immigration news – providing health professionals and immigrant rights activists a “heads up” on immigration, xenophobia, and health. Looking at current events and national policy through a health perspective, we see that our immigration laws are powerful determinants of health for immigrants in the United States. In the past, few public health researchers have focused on the ways immigration policies affect the rights, opportunities, and health of immigrants. But the public health field is increasingly taking notice that immigration policy is health policy. We believe that we will be more likely to achieve justice for immigrants and healthier communities when public health professionals understand (and address) the social and policy contexts that impact immigrant communities. Last year, the American Public Health Association issued a policy statement supporting an end to the Secure Communities enforcement program. The American Journal of Public Health published a recent study calling for more research on how state-level immigration policies, specifically, SB 1070, affect public health. A growing number of researchers are trying to document and understand how policies and the experience of being undocumented affects health, such as immigrants’ access to health care (Stevens et al., 2010; Vargas Bustamante et al., 2011) and the impact of family separation, legal vulnerability, and stress in undocumented families (Arbona et al., 2010; Brabeck and Xu, 2010). This is an important starting point! Yet, the immediate experiences of immigrants and their families are the result of the full context of their lives in the United States, as well as our nation’s often anti-immigrant history, culture, politics, and laws. Public health research and action must reflect this full picture. We have created a framework to illustrate the web of factors related to laws and policies that have an impact on the health of immigrants. 1) Our laws and policies are rooted in historical, political and cultural contexts. The US has implemented immigration policies since it founding, including deportation and exclusionary policies such as the Chinese Exclusion Act in 1882. Each wave of anti-immigrant policy has been driven by racist and xenophobic narratives – immigrants viewed as a threat or as undeserving. The legacies of these cultural narratives and harmful policies continue to impact how immigrants are treated both in our political and popular debates and narratives. 2) These laws and policies influence the circumstances of immigrant’s lives, specifically their rights, resources, and safety. Can immigrants access appropriate and affordable health care services? Do immigrant workers receive fair wages and are they safe in their workplaces? Are immigrant children able to attend schools and universities? Do immigrants feel respected and safe in their communities? All of these questions are decided by specific federal, state, and local policies that expand or limit the rights and resources that determine the opportunities for immigrants and their families, as well as their overall safety in this nation as they pursue those opportunities. These three factors are interconnected, as rights can create safety and access to resources or safety and resources can support individuals to exercise their rights. 3) These three factors are also inseparable, because the positive presence of all three are needed to promote positive physical, mental and community health outcomes. When protective factors – such as access to health and educational services – align, immigrants will experience greater health and well-being. The lack of any or all three of these, such as limited access to employment and educational opportunities, stress and fear due to discrimination and anti-immigrant legislation, or vulnerability to violence, result in significant health risks. Public health professionals and immigrants rights activists will have to make critical assessments of how existing and proposed policies may protect or harm the health of our nation’s immigrants. Our hope is that this diagram provides a framework for considering how various immigration policies may actually impact immigrant communities. For example, the debate on “comprehensive immigration reform” is just heating up. It is heartening that there is growing support for a path to citizenship, but the proposals currently being developed would make the process lengthy and burdensome and continue existing bans on receiving public benefits. The proposals would also further codify border militarization and enforcement programs. Public health has an important role to play in these debates – ensuring that the true community costs are considered as immigration policy decisions move forward. When we look at this diagram, we also see many opportunities for action! People working in all areas of public health can incorporate an immigrants rights perspective into their work. 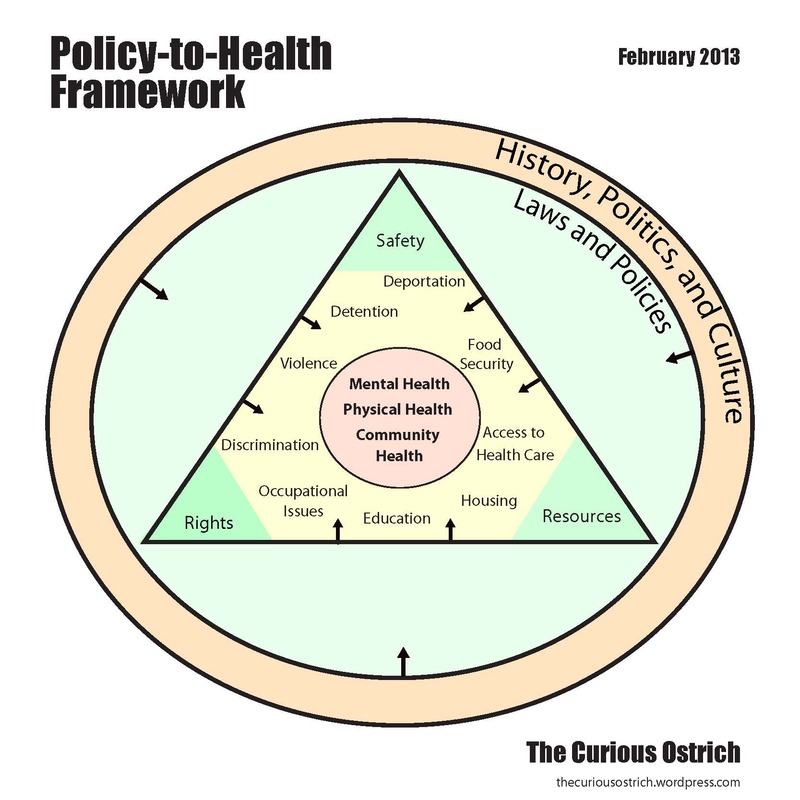 In the coming months, we will provide information and discussion on some of the main health issue areas in this diagram. And we will share ideas and opportunities for health and immigration activists alike to participate in this work. Stay tuned to the Curious Ostrich for up-to-date health research and analysis.